Today is my 10 year wedding anniversary so it seemed like the best day to open my etsy shop! Please help me spread the word about the giveaway and the shop opening. 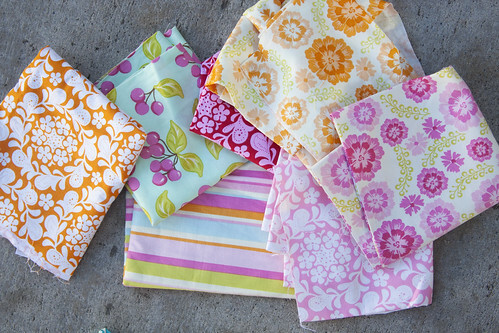 I will be offering to the winner a choice between these fabrics. I will be making the winner something from the fabric that they choose that is personally just for them. I will be looking at their blog and/or flickr to find out what they like so that I can make them something special. 3. become a follower of Stitches & Scissors. Please leave a new comment for each thing that you do so that you will be entered into the giveaway those amount of times. Goodluck! I am so excited to now have a etsy shop but scared to. I am just looking at it as an adventure. To go to the shop just go to my tab bar and click on My Shop or click here and check out all I have listed. Right now I just have quilts, pillows, blankets. I will have children clothes up for sale but I am perfecting my sewing on those so that they are perfect! So stay tuned for clothes. To celebrate our anniversary we are going away for a long weekend so I will keep this giveaway open til next Thursday September 2. I will announce the winner on Friday the 3rd. happy anniversary!! many thanks for the chance!! those fabrics are fabulous!! oh geez - you two look like such youngins' in that photo - happy anniversary!! and congrats on opening the shop! Happy Anniversary and Congrats on opening your Etsy shop! ok, and just posted a link to your shop on my FB! Happy Anniversary! And I wish you luck on your shop. I'm also a follower (and proud of it!). Congrats on your wedding anniversary and opening your shop. Good-luck with the shop! Woohoo - I'm going to go and check out your shop right now. Thanks for the giveaway! Congrats...and what a wonderful giveaway! It's fun to be opening an etsy shop...best of luck! Happy Anniversary and good luck with the shop! Congrats on the anniversary and the shop. I love all of those fabrics. I would love to win! Good luck with you shop, congratulations! Congratulations on both exciting celebrations! My husband and I are about to celebrate our 3rd anniversary and I look forward to such a great milestone as 10 years. Happy Anniversary!! I am only at 8 1/2 years!! :D Congradulations!!! congratulations! good luck with your shop. Great fabric choices! 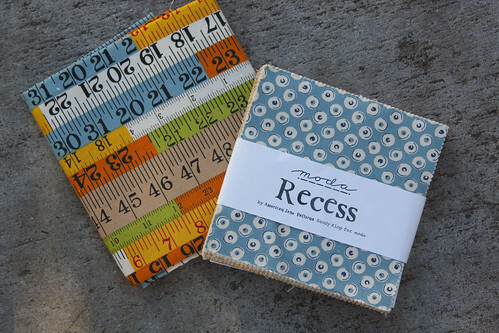 I love that recess line. Congrats on hitting the 10 year mark. The mister and I just celebrated our 7th. Time goes by so fast! A big congrats to you! Am going to go look at your etsy store. Where you going for the getaway with the hubby? I posted on Facebook (on my page). Good luck with the shop and Happy Anniversary! 10 years is awesome! I wish you many many more! And I posted on FB about ya! I blogged about your giveaway!!! awesome! i love all of the choices!!! mazl tov on your ten years! Congratulations! Your wedding photo is adorable. Thanks for the chance to win. Happy anniversary! Thanks for a chance at a nice giveaway. I would choose the Flea Market Fancy by Denise Schmidt. Hard to choose. They are all so pretty. I can't believe you have all of that Farmer's market! In all of my favorite prints and colors!!! and I follow you - subscribe in Google reader, is that the same. I'll double check if I'm for sure a follower and then i'll be on if I'm not already. would you like me to ramble on some more? Good luck with your shop, i'm sure you will do well. you are so creative! I love the pillows on your daughters bed in your flickr, adorable! 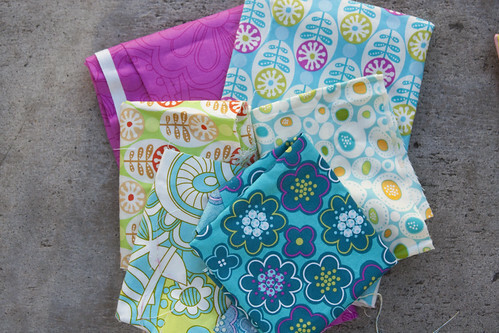 Awesome giveaway and thank you for offering up some yummy fabrics! What a fun giveaway! I love the idea of customizing it to the winner. Happy anniversary and congrats on the etsy shop! Congratulations on your new shop and your Anniversary! The fabrics are beautiful! I will also follow you, love your blog! 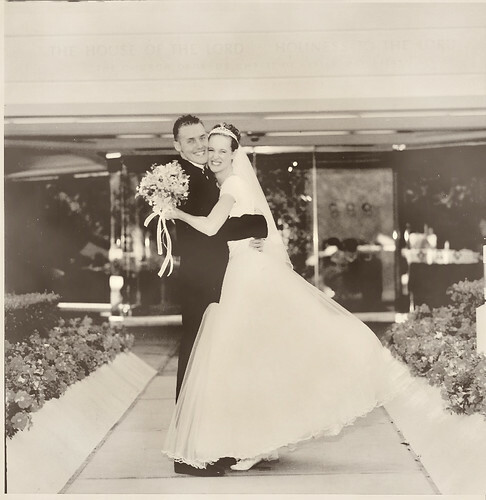 ok i am trying this out and i am new to it: first congrats to your 10 yrs of wedded bliss! 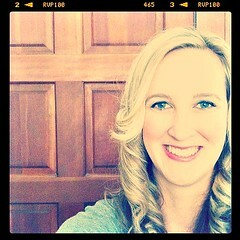 i am going to be a follower, i am friends with Nicole Kerr i guess that is how you will find me when I win LOL! thank you for a chance at winning, I dont have that kind of luck so I wont hold my breath but I do enjoy trying...and your site is sure nice! hope to win my leaving this comment! Happy 10th! Have fun this weekend! I signed up to be a follower! Congratulations Darci !!! 10 years and a new shop. Best of luck !! congratulations!! 10 years!! many happy more! Happy Anniversary! What a lovely picture! Thanks for this great giveaway and have a wonderful weekend. Congratulations! Happy anniversary and etsy grand opening! Your flower pillow is super cute. happy 10th anniversary and congrats on the grand opening. Happy 10th Anniversary and Congratulations on your Grand Opening! What a great way to celebrate your anniversary and grand opening - woo hoo! Wishing you many years of happiness. I am a follower and look forward to your posts. Again congratulations on both your anniversary and grand opening!! Happy anniversary and best of luck with your etsy shop! Thanks for a great giveaway! Wow I love your flower pillow! thanks again Memory B - cabatclan@aol.com or if i am lucky enough to win contact me through Nicole Kerr! congratulations on your 10th anniversary and good luck with the etsy shop! how exciting is that! I am a follower of stiches and scissors! i just facebooked your giveaway! i have blogged about your giveaway too! I've never owned any FMF so I'd like to have something from that! I've been reading Stitches and Scissors for a good long time. I'm posting because I want to win! I already follow your blog, does that count? Congratulations on your anniversary and etsy shop opening. I would like something made from Flea Market Fancy. Like the fabric and do not own anything made with it. Thank you for this giveaway. Happy Anniversary - May you have 10 & 10 & 10 more! Hope you had a great weekend getaway. Your giveaway is great too. I need a new handbag with lots of pockets so I hope I win! 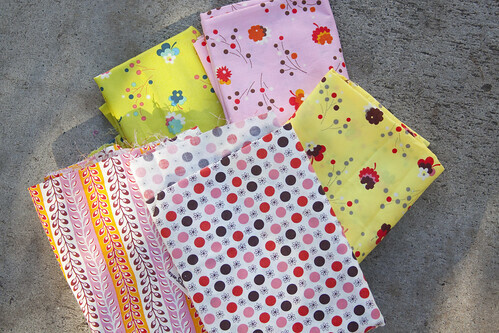 choice 1 is my favorite fabrics! we celebrated our 10year this year as well in April.Congratulations! Congrats on your Anniversary! I'm a new follower. Don't blog or tweet, but will mention you on facebook. Would love to win your fabric. Wow- nice giveaway. Congrats on your anniversary. Best of luck with the opening of the shop! Happy 10th!